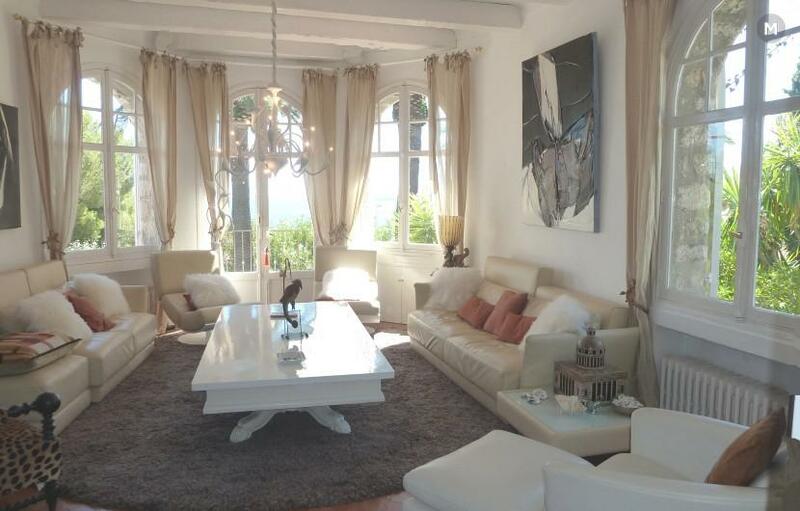 Ideally located, facing the sea with an unobstructed 180 ° view of the Cap d'Antibes and the Lérins Islands and 5 minutes from La Croisette, it is located in the beautiful private domain. This charming house consists of a main house for 10 people and two other guest houses for 4 people and 6 people each. These three houses are spread around a magnificent heated pool, without chlorine, in a huge Mediterranean garden (around 3500 m²), many terraces facing the sea. Very nice amenities for 10 to 18 people, three houses with stunning sea views, fully air-conditioned, Wi-Fi, 3 kitchens, 7 bathrooms, 8wc. Secure domain with caretaker, private access, large parking at the entrance with electric gate, up to seven cars. with 2 ° House (4 people) + 3 ° HOUSE (4 people) + SWIMMING POOL. Located at the entrance of Cannes, close beaches Croisette and Palm Beach, Port Canto, shops. South and Southeast View of 1800 on the bay of Cap d'Antibes, the Lérins Islands, the Palm Beach. Superb view of greenery and sea. Close to the sea and Cannes, so close to the road, a background noise but not very embarrassing, a great view and location that compensates. - STYLE: House of character in stones renovated and regularly maintained. - FIELD SURFACE: approx. 3500 m². Mediterranean garden, fruit trees, beautiful vegetation. - SWIMMING POOL: Nice swimming pool about 5x12 // Pool Possible heated by heat pump. The pool runs on "bio-Uv" (oxygen) and has no Chore. BARBECUE: Barbecue + outdoor oven on the south terrace. Ping pong table. Entrance. Toilets and locker rooms .Beautiful living room in "L", high ceilings, living room, dining room, TV, fax, Internet: Wi-Fi. Sea view, French windows on the South terrace. Equipped new kitchen, access also directly in the garden, with American Refrigerator, 2 dishwashers, Oven + Microwave, Drawer heating, corner breakfast. - 1 bedroom "red" south overlooking terrace sea view, 2 beds 80 cm TV & bathroom with double sinks and wc, safe, air-conditioned. Opening onto a bathroom with separate shower and separate toilet. -5th bedroom "White" air-conditioned (2 beds 90cmx200) TV & safe & bathroom (double sink and shower) Independent toilets on this level. - The sleeping is provided for a maximum of 10 people. Charming family house. Light, sober and comfortable interior (sanitary and new kitchen). Superb view of greenery and sea. Near seaside All rooms are equipped with a flat-screen TV and air-conditioned. Gas central heating throughout the house. - 1 living room: with sofa bed (160cm) overlooking beautiful private terrace sea view / Screen Flat TV, safe. - 1 large room: Lounge Area: Sofa, 2 Armchairs / Corner Bedroom (1 convertible sofa in 1 large bed 160cm), TV, Safe. LCD flat screen, Alarm and safe, 2 windows with sea view and 2 windows overlooking the garden. - 2 bedrooms (2 beds of 0.80cm or assembled 160cm) with 1 window sea view, with bathroom (shower and washbasin) + independent toilet. - The sleeping is provided for a maximum of 6 people. - Chauffeur-driven car service included in the offer for your trips during conferences. - Breakfast available on request from the owner. • Furniture and movable objects must suffer only from the depreciation resulting from the normal use for which they are intended. Those who, upon the expiry of this agreement will be missing or have been put out of service for reasons other than normal wear and tear, shall be paid or replaced by the lessee with the consent of the owner or his agent. This clause also applies to papers, draperies and the building in general. (b) the price of washing or cleaning carpets, blankets, mattresses, bedding, etc., that have been stained. • The taker binds himself to use the furniture and objects of the rented property for the use for which it is intended and in the places where they are. He formally refrains from transporting them outside the rented premises. • The taker must abstain absolutely to throw in the sinks, bath, sink, wash-house, WC or pool etc., objects likely to obstruct the pipes, otherwise he will be liable for the costs incurred for the delivery in use of these devices. • In the event of termination, the lessee may under no circumstances sublet or assign his rights to this agreement without the express consent of the owner or his agent; he will have to live in the rented premises, and will not be able, under any pretext, to store furniture there, except for the linen and small objects. • The premises rented above must under no circumstances be occupied by a number of people greater than that indicated in the special provisions, unless prior written consent of the owner. • The lessee will have to allow to carry out, in the places, the urgent works necessary for the maintenance in rented premises and common equipment items. The lessee may bring a pet into the rented premises with the express agreement of the owner or his agent.